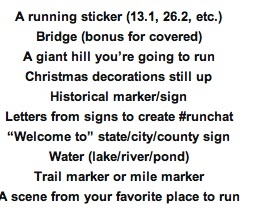 Food, Running, and Other Ramblings: RunChat Scavenger Hunt! I found 6 items on the list. I could probably gotten more if I wasn't sick and just wanted to call it a day. 2) A giant hill I'm going to run up. It may not look too bad, but I had to go up it a bit to get the whole thing...and please note the billboard at the top. It's for McDonald's. Makes me want to puke every time I come huffing and puffing to the top. 3) Christmas decoration still up. I was surprised I didn't find more. After all, we've been snow covered for a while. Decorations up in March really isn't that strange around here. 4) Water. I live by the Root River and run by it frequently. I should have waited until we got to the lake. The water was very pretty out there today. 5) Trail Marker. I think we are fortunate to live by these paths. I love running them! 6) A scene from my favorite place to run. The beginning of the Root River Path. The scavenger hunt was a really fun idea! I would love to do one of these more often, especially in warmer weather! Hope everyone had a Happy Easter! 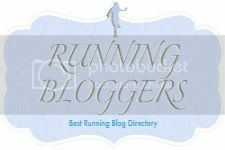 Did you run today?